Established in the year 2011, Union Pump Company, is known to be one of the finest manufacturers and exporter of this impeccable range of Chemical Pumps & Vacuum Cleaners. The offered range comprises the finest Chemical Process Pump, Karcher Cleaning Systems and Uniboost Pumps, which are highly acclaimed and asked for. Manufacturing of this range is done following the set industry norms and guidelines, utilizing the finest raw material and modern machines. Owing to this, the offered range is known to have a superior performance, strength, precision, capacity and service life. in addition to this, the offered range is known to be marked at the most reasonable rate possible. The state-of-the-art infrastructure at Union Pump Company is regularly upgraded, in order to maximize our reach in the market. The facility equipped with all the machinery and equipment needed for the generation of higher output. For reasons of managing the firm’s operations in the most efficient and effective possible manner, the facility has been parted into a number of highly operational units. These units, in the most dedicated and united manner, help us attain a number of the firm’s predefined objectives. 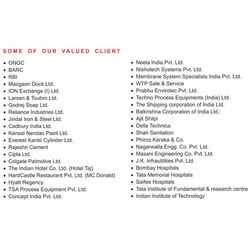 Further, our huge and highly reputed client base comprising Aguapuro Equipments Private Limited, TSA Process Equipments Limited and Membrane System (I) Private Limited, is owed to our following of the set industry norms and guidelines. Under the leadership of Mr. Pankaj Shah, our Director, we have managed to attain greater and unimaginable heights of success in less than two decade of our existence. In addition, his managerial skills, ability understand market changes and make commendable decisions, have been an asset to the firm. In addition, he takes special care of the employees, for reasons of keeping them motivated. 2009-10 Rs. 10 - 25 Crore Approx. Our team of highly efficient and dedicated professionals at Union Pump Company, is recruited based on their skills and past experiences. These experts, with superior efficiency and dedication, direct their efforts and energy, towards the attainment of a number of the organization’s targets. The team of professionals has been sorted into several highly operational units, in a highly successful attempt to manage their operations, in the most effective and efficient possible manner. The division is commenced as per the experts’ area of expertise. The highly modernistic state-of-the-art infrastructural facility at Union Pump Company has been laced with all the necessary machinery and equipment, for the facilitation of the attainment of several organizational goals and objectives. The facility is regularly upgraded for reasons of attaining a better position in the market. To manage the firm’s operations in the smoothest and the most efficient possible manner, it has been parted into a number of highly operational units. These units, further, ensures the maximization of the firm’s production capacity. To us at Union Pump Company, quality is of top priority. Thus we engage in the utilization of quality raw materials and advanced technology, in accordance with the set industry norms and guidelines. Owing to of this, the product’s performance, capacity, precision, strength and service life, is widely praised. In addition to this, the products are sent to our quality experts, for standardization of this range. These professionals, with utmost precision, examine and eliminate, any and every manufacturing defect. Jindal Iron & Steel Ltd.
We are known to be one of the leading manufacturers, distributors and importers of this impeccable range of Industrial & Chemical Pumps and Accessories. For reasons of maintaining this market standing, we engage in the utilization of the finest raw materials and advanced technology, following the set industry norms and guidelines. This ensures the product’s performance, strength, performance, service life and capacity. In addition, the offered range is known to have a perfect packaging, standardized quality and is known to be marked at the most reasonable rate possible.